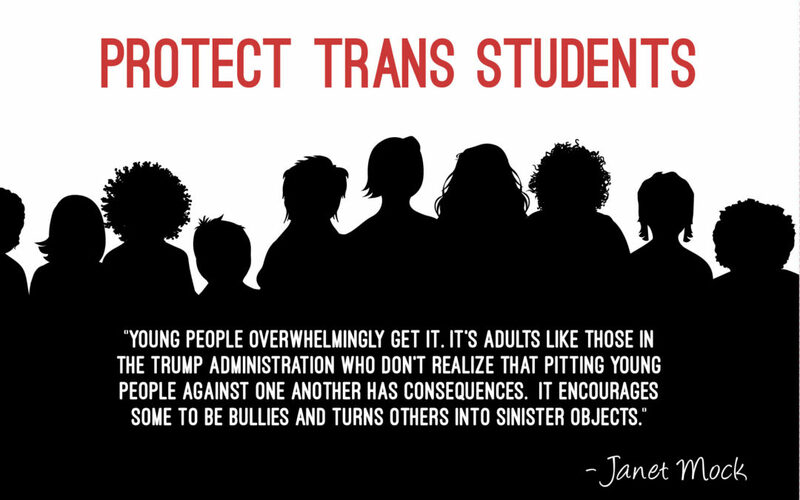 On February 22nd, the Trump Administration rescinded previous guidelines protecting trans students in public schools. In response, New York Times’ bestselling author, JANET MOCK, and THE ALLY COALITION have partnered to create the #DearBetsyDevos campaign. 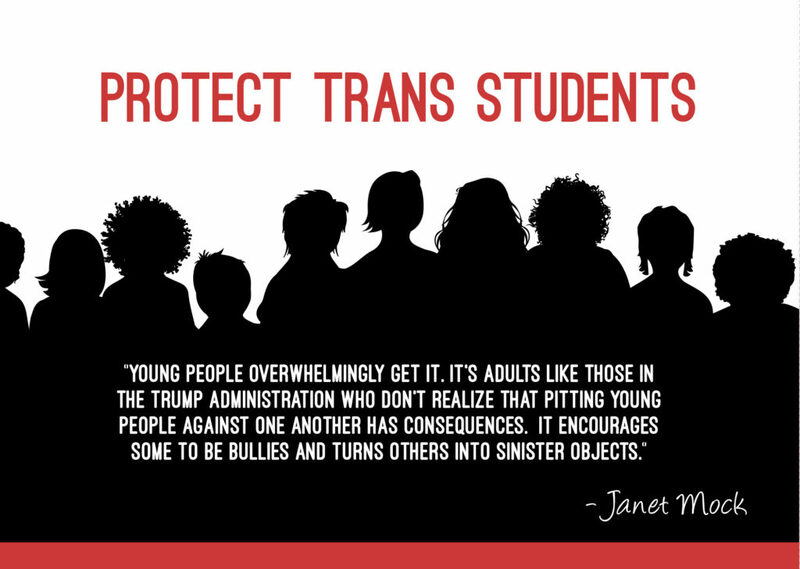 The campaign will enable signers to send postcards demanding that Secretary BETSY DEVOS and the Department of Education protect trans students and provide a school environment in which their identity is accommodated in accordance with Title IX protections. 78% of trans and gender nonconforming students experience harassment at school and are subject to more violence and harassment than their peers. This helps explain why many trans students are pushed out of school and why nearly half of trans youth have considered suicide. “Young people overwhelmingly get it. It’s adults like those in the Trump administration who don’t realize that pitting young people against one another has consequences. It encourages some to be bullies and it turns others into sinister objects.” said Janet Mock. 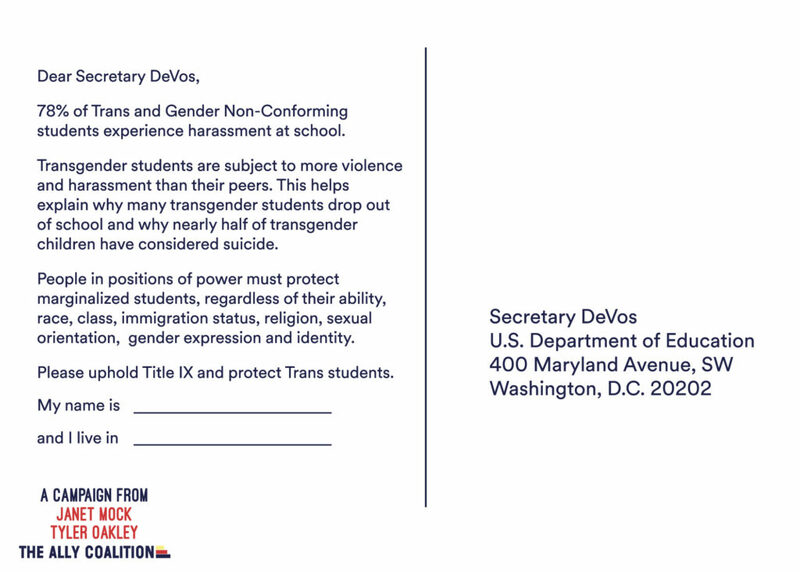 The postcards remind Secretary DeVos that it is her duty to protect all students and asks her to uphold Title IX protections by giving trans students the safe spaces they deserve. This campaign was built with the help of Tumblr and Care2.